Copy DVD to Hard Drive, Protected DVD to Computer or External Hard Drive? "I desire to watch my favorite Disney Big Hero 6 movie on this trip by playing it's DVD on my MacBook Air. But I found there isn't suitable place to put it in may package when packing. My heart will be totally broken if it is scratched by other things. So, could you give me some practical guide about how to copy DVD to hard drive or make a copy to MacBook for playback? I will be so appreciate." -from Yahoo answer. How to clone a DVD? This bothering problem hasn't been solved for some people. Perhaps some of them have tried many ways or DVD copying software before. But finally failed. Actually, this is a very simple task once you have chosen the right tool to backup DVD. Next, we summarized the following must-known solutions for readers in case of coming across the same problems. Obviously, nowadays, lots of people prefer to enjoy their favored movies on computer when they are travelling or on the plane. It is generally believed that watching movie is the best way to kill time. But, playing DVD is not so recommended since DVD is fragile and easy to be scratched. If it is unplayable eventually, nothing can make up for your loss so that you have to sleep all the time. Why not copy DVD movie to computer HDD/SSD or external hard drive in advance? In addition, some movie collectors will spend much time on DVD storage. Although high quality DVD is loved by movie fans, regularly checking and cleaning stored DVD is a must-work in order to keep DVDs away from unexpected scratching or damping due to the wet weather. As time goes on, suchlike work will become more time-consuming and energy-consuming. If you have made digital copies of a DVD, I believe everything will become far easier. Normally, for only streaming movie on computer while travelling, users just need to clone DVD to computer hard disk or external hard drive as video files like files with MP4, AVI, WMV, FLV, MOV, etc video formats which can be playable on a number of video players. Although some video files' quality is lower than the original DVD after conversion, the size will be smaller so that you can save more movies on your HDD. And for storing DVD movies safely and easily in long term, users are suggested to save DVD to computer hard drive/external hard drive as ISO image/DVD folder/MPEG-2 single file. These three digital files will guarantee movies' video/audio quality the same as DVD, but correspondingly their size will become unpredictable. This way is practical to DVD collectors who have high video quality requirements and also own a big size hard disk. Now, how to realize those copying tasks? Dig out and download the best DVD ripper. 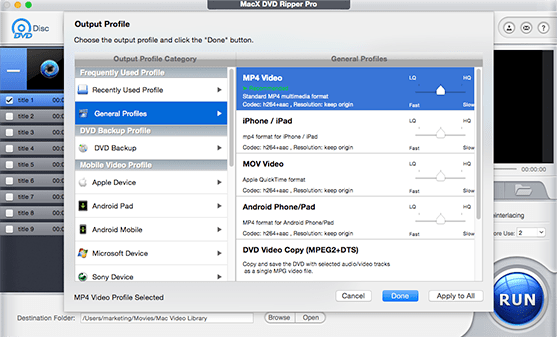 To MacX DVD Ripper Pro users, it is so easy because this DVD ripping tool offers the best solution to backup DVD to hard drive as video files with multiple video/audio formats(including MP4, QT, FLV, H.264, MOV, AVI, MP3, MPEG, M4V,etc) on Mac and as ISO image/DVD folder/MPEG-2 single file with original video/audio quality. Thus, you can freely view your favorite DVD movies with high quality on the move without considering the scratching problem. Now, following the below steps to transfer DVD to HDD/SSD. Step 1: After downloading this DVD to hard drive ripper on Mac, launch it and put homemade DVD to Mac computer's HDD. Click "DVD" button import DVD files. If you are a windows user, please download the Windows version. Step 2: To convert DVD to hard drive on Mac, you can choose any widely used format like MP4, AVI, MOV, MPEG, MP3, etc. If you want to rip your DVD to any mobile device like iPhone, iPad, Android etc, you can choose the respective device format from the scheme. Step 3: Click the "Browse" button to figure out a destination folder to save the output video file. Step 4: Press "RUN" to start to convert DVD to storage on Mac. All the tasks can be finished with 5 mins if your hardware configuration is advanced enough. Afterwards, you can eventually transfer DVD to hard disk. As is known to all, each of new released DVD movies is well protected by different encryption technologies for keeping DVDs away from any illegal use. Though there are many DVD ripping programs on the market, most of tools are also hopeless while facing DVD copyright protection. For example, Handbrake only can rip unencrypted DVD or Bluray discs; DVD shrink only can backup DVD files on Windows OS X and will disappoint you when cloning the newly purchased DVD movies; great DVD ripping tool – DVDFab doesn't timely update for supporting the latest macOS so that it will drive you crazy when you want to transfer DVD to USB hard drive. However, do not sigh to the frustration; the constantly updated MacX DVD Ripper Pro will help you tackle all the issues mentioned above. It is capable of decrypting and ripping all types of encrypted DVD and copy-protected DVD (by removing DVD CSS, region code, RCE, Sony ArccOS, UOPs, Disney, etc) and rip DVD to MP4 H.264, MOV, FLV, MPEG, M4V, AVI, QT etc video formats for storage on Mac's HDD. Moreover, it can rip copy-protected DVD to iPhone XS/XR/X/8/7/6S/Plus/6/6 Plus/5S/5C/5, iPad Air, iPad Mini , iPad Pro, iPod touch 5/4, iPod classic, Apple TV 4, etc on Mac (macOS Mojave) for enjoying at any time. Copy DVD to USB drive tip: This DVD ripper Mac also allows users to copy DVD to USB drive and the procedure is similar to backup DVD to hard drive. In addition, after finishing the copying steps, open your target destination folder and find out the video files. Then, directly plug video file to your external hard drive. Move the DVD copy from Mac hard disk to iPhone iPad etc: you are recommended to download MacX MediaTrans for video movie file transfer without iTunes, which lets you quickly transfer DVD movies to mobile devices without video formts limits thanks to its built-in video converter. How to copy a DVD on a Mac? This guide tells you the simplest way to copy protected/homemade DVD movies on MacBook, iMac 5K, Mac Mini etc (macOS Mojave) to hard drive, DVD, mobiles with fast speed and high quality. Best MacX DVD Ripper Pro allows you to freely rip any copy-protected DVDs to ISO image, MPEG2 and MKV or even portable devices. It's a handy thing to have when you're trying to back up your DVD collection.